If you're not a PHP programmer, it can be tricky to modify Drupal to fit your needs, and it's also difficult to know exactly where to start when you're ready to learn. Well, welcome to PHP programming basics. 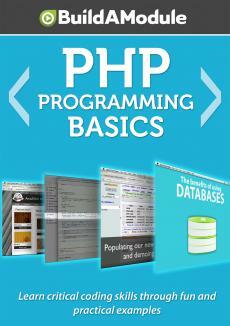 In this collection we're going to gently introduce you to some of the most important concepts in PHP and programming in general. And by the end of these videos, you'll have all of the tools that you need to both make minor adjustments to Drupal and also build rich original applications on top of the Drupal framework. For this video series, you don't need to know anything about programming. We're going to start at the very beginning. And if you are starting from scratch, this is going to be a lot of fun. While you can certainly use this series to learn how to do things like adjusted template file and Drupal or modify a form, the videos are designed to give you the tools you need to become a skillful PHP programmer. Being able to write your own code is powerful and you can automate tasks that take a long time to complete manually, you can build tools that other people can use to solve a variety of problems, and there's a lot of other applications.